If you’ve tried diet programs in the past, you might be a little jaded after months of expensive meals and supplements with little change on the scale. Sound about right? Let us be the first to tell you that OPTIFAST is not like those other products. Instead, OPTIFAST is a medically-supervised weight loss program that is guaranteed to deliver results if you follow the program and follow the advice of a trained professional. Weigh Less for Way Less is proud to offer this program as part of the individualized weight loss plans we create for our clients. 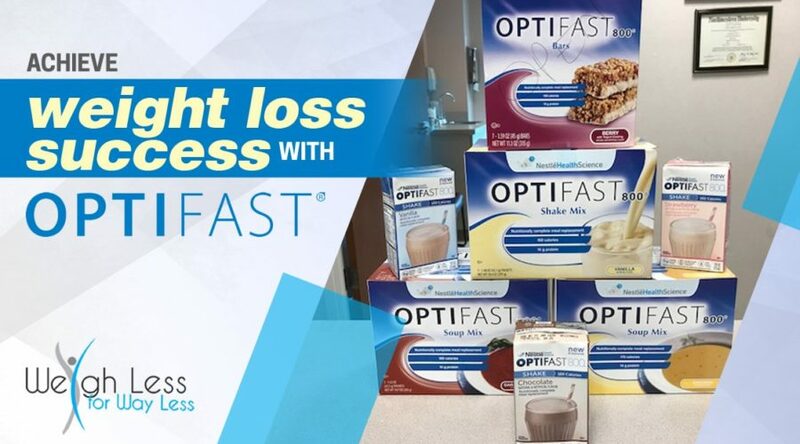 Read on to find out whether meal replacement options might be a way for you to meet your weight loss goals and achieve weight loss success with OPTIFAST. OPTIFAST is a 26-week weight loss program that starts with meal replacement shakes and transitions to self-prepared meals. Dietary changes are paired with education and support at every step of the way. Monitoring of your physical health and mental well-being throughout the program. OPTIFAST can be completed on its own or in conjunction with weight loss surgery. It can help you lose the weight you need to be a candidate for surgery, or help you maintain a healthy weight once the procedure is complete. The first four months of the OPTIFAST program are known as the Active Weight Loss phase. Your diet will consist of a variety of meal replacement shakes and bars. Each product is specially designed to give you the nutrients you need while kicking your weight loss into high gear. Our team at Weigh Less for Way Less will work with you to create a meal plan that works with your lifestyle and your taste preferences. Trust us; you won’t be drinking the same boring shakes for three meals per day! The final two months of OPTIFAST are the Transition phase, in which you begin to slowly reintroduce other foods into your diet. During this time, you will learn how to change the way you approach food and receive instruction on how to prepare healthy, nutritious meals that match your palette, your lifestyle, and your budget. Once the six-month program is complete, you’ll enter the maintenance phase, which lasts at least 18 months but can be as long as needed. Patients are encouraged to attend support sessions and continue using OPTIFAST products to stay on track and keep the weight off. You can also choose a partial version of OPTIFAST that calls for replacing two meals per day instead of all three. We’ve found that this approach works well for many of our clients and pairs well with the Verju laser weight loss system. 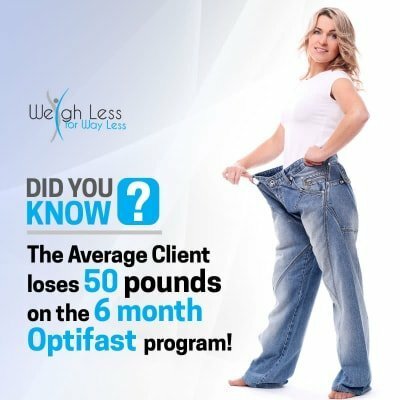 The average OPTIFAST client loses 50 pounds over the course of the six-month program. Blood pressure and cholesterol are also lowered by an average of 10-15 percent and the risk for diabetes decreases. Not only do OPTIFAST patients lose weight, they keep it off. About half of all patients maintain significant weight loss five years after their treatment ends. This is because you are not just temporarily changing your diet, you are learning long-term healthy habits with the help of a trained medical professional. Our team at Weigh Less for Way Less can help you determine whether you are a good candidate for the OPTIFAST program. We’ll evaluate your health and your weight loss goals and create an individualized plan to help you get there. Contact us today to get take the first step on your journey to weight loss success with OPTIFAST. We have offices in Elmhurst, Oak Lawn, and Burr Ridge, IL. Contact us for more information. 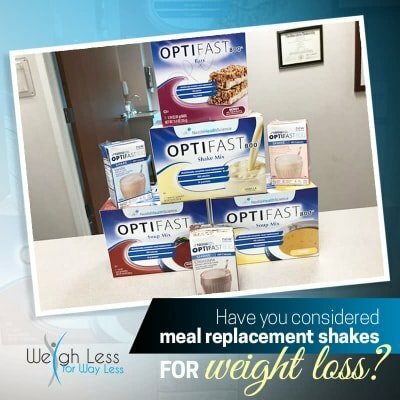 Have a?question about?meal replacement options or how to achieve weight loss success with OPTIFAST? ?